Once your players have their breath under control (see the blog post below), one of the next steps in teaching them how to build a strong mental game is educating them about controllables. The idea behind them is no different than anything in life: There are always going to be things we can and cannot control. The key is to understand where we choose to invest our energy and where we choose to let go. Stressing over things you can’t influence can lead to a snowball effect which degrades performance and can ruin enthusiasm for training. On the flip side, investing your time and energy into things you can control helps you take ownership of your career by understanding what you can influence. A healthy combination of the two helps lead to a strong mental game, but a lack in either category can send a player spiraling for confidence. How do we prevent this? Well, it starts with understanding the difference between what we can and cannot control. To start, I think it’s crucial people know what they can control before they understand what they can’t. 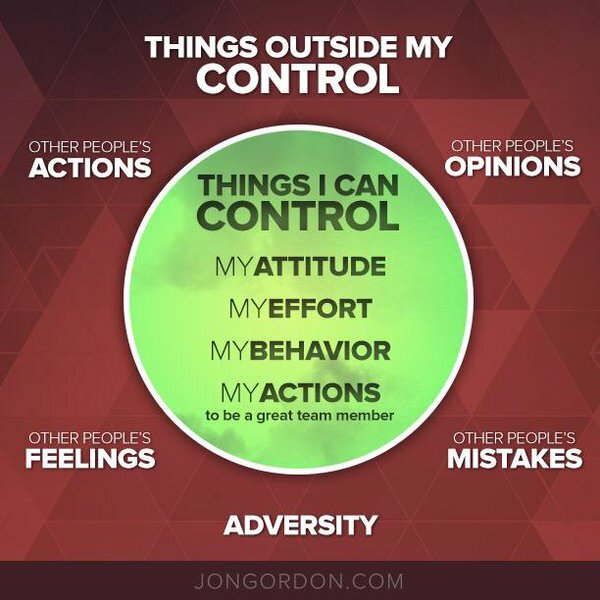 Jon Gordon does a great job breaking this down (see image below) by saying at all times, we control our attitude, effort, behavior, and actions. This includes how we think, respond to adversity, treat other people, let go of the past, and focus on the present. By process of elimination, anything that doesn’t lie within these four controllables is ultimately something we can’t control! This includes our environment, adversity, the past, and the thoughts, feelings, and actions of other people. Let’s think of this in terms of a baseball or softball setting. On the diamond, there are plenty of things we cannot control which include weather, field conditions, how you feel that day, your opponent, and the umpires - to name a few. With this, how often do we find ourselves complaining about how hot or cold it is outside? What about a bad strike three call we got rung up on? Or how about the fact that the mound isn’t made exactly to your liking and you can’t get a great grip? The bottom line is this: If we know that we can’t control these things, why do we spend so much time and energy worrying about them? As humans, we have a limited amount of time and energy that we can spend throughout the day. If we are constantly worrying about things we can’t influence and playing victim to our situation, we’ll lose sight of the things that we can actually control. Is it the tournament’s fault that they scheduled you for an 8 a.m. game and you’re exhausted, or is it your fault that you were up playing video games until 2 a.m.? Was wearing short sleeves a good idea when the forecast for game time read a staggering 38 degrees? Was it the umpire’s fault you struck out on a borderline pitch, or was it your fault for watching the first two right down the middle? It may be brutally cold outside, but it’s not any warmer for your opponent! The mound might not be in great shape, but they’re not rolling out a brand new one for the other team’s pitcher! The same problems you’re dealing with are probably the same problems everyone else is dealing with. The difference? Your opponent is figuring things out by focusing on their controllables. You, on the other hand, are getting worked up over things you can’t control and turning into a victim of your circumstances. This is part of the reason why it is so huge to have a strong mental game: You have control over it at all times! Only you can control how you breathe, respond to adversity, and get 100% committed to winning the next pitch. Your process and commitment to executing it are always within your control. Sometimes we might not get the result we want, but we always have the ability to regroup and get ourselves ready to win the next pitch. If we’re constantly worrying about the field conditions, weather, or any other distractions we don’t have control over, we’ll never be able to do this. Coaches: Keep it simple, get kids to control their attitude, effort, behavior, and actions to become great teammates! If Jonny strikes out, lift his chin up and get him ready for his next at-bat. He can’t control what’s already happened, but he can control his attitude, effort, and how he approaches his next at-bat. If Sam dogs out a ground ball to the shortstop because he’s upset he just missed it, pull him aside and let him know he’s letting his teammates down by letting a poor result dictate how he feels and acts. If Joey can’t throw strikes because the umpire’s zone is too tight, don’t feed his negativity by arguing with the umpire as well. Instead, get him focused on a consistent, attainable goal where he’s going to make adjustments, compensate, and compete so he can give his team a chance to win the game. The next time one of your players gets upset at practice or a game, make him ask himself: “Is this something that I can control?” If it is, make an adjustment and get them back on their feet so they can compete and be a great teammate. If it’s not, tell them to leave it where they found it. This game is going to beat you up enough on its own - don’t add to it by worrying about things you can’t control. This article was written by staff member Andrew Parks. As discussed before, I think most people would agree the mental game in baseball is a crucial skill to help players succeed at high levels of competition. Due to the long season, the time between action, and a multitude of other factors, players of all abilities are vulnerable to poor thinking patterns which can erode a player’s confidence and hurt their performance. Having a strong mental game helps players get control of themselves so they can compete in all environments and learn how to deal with failure, manage success, and keep their emotions from ruining their love of the game. Like anything else, the mental game is a skill and must be practiced for you to get better at it! Therefore, coaches must find ways to incorporate the mental game into practice so kids can learn and work at it! Looking at the mental game as a whole can be overwhelming, so over the next several blog posts I’m going to be posting simple ideas that all coaches can use to help train it. If it’s good enough for Mike Trout, Anthony Rizzo, John Maddon, Manny Ramirez, Derek Johnson, and many more - it’s good enough for you. As for physical benefits,the breath brings oxygen to the brain to help you think clearly. This is crucial because the brain cannot differentiate between different types of stress. In other words, it cannot tell the difference between you on the mound in a pressure situation, or you being chased by a sabertooth tiger! Both will take an according toll on your body despite being completely different circumstances! This may sound funny, butyour brain’s number one priority is survival. Any sort of threat will turn on the sympathetic nervous system (“fight or flight”) in your CNS. If you cannot get oxygen to your brain and rationalize the situation, your body will go into the “flight” stage, shut down, and allocate all resources towards keeping you safe. This is great for when you’re being chased for your life, but not so great when it comes to executing fine motor skills. Don’t make baseball a life or death situation when you’re up to bat with the game on the line - just breathe! Along with this, breathing helps release tension throughout the body. Loose muscles are fast muscles. Any sort of tension from toes to fingertips will keep you from moving freely, athletically, and will have a negative impact on balance, rhythm, and timing. Breathing, on the other hand, will do just the opposite. For players who struggle with this and controlling nerves before/during games, get them to focus on the exhale portion of the breath. On the contrary, focusing on the inhale is a great way to help increase energy levels. Another physical benefit to breathing is it showspositive body language. A quality deep breath should be noticeably different from just a regular breath. Athletes must learn how to enlarge their diaphragm by puffing their chest and elevating their shoulders. This expands the lungs and helps counteract bad body language such as lowered eyes and hunched shoulders. Psychologists will argue that up to 70% of your communication is done non-verbally. Be careful of the message you’re sending to other team. Hitters are like sharks, and they feast when they smell blood. As for intangible benefits, the breath is a great tool tolet go of the last pitch and get focused on the next pitch. There is great freedom is enabling athletes to play with their sole focus on the pitch they are about to see. If they’re constantly bogged down by the emotions of the last pitch or any pitch before that, their performance will snowball out of control. Breathe in the emotions, bad thoughts, anxieties - and then exhale them out. Be where your feet are. The breath is also a great way to “check-in” with how an athlete is feeling physically and mentally during training or competition. If an athlete is unable to get a complete inhale and exhale without being cut short, it is a sign that they are losing control. As Tom Hanson and Ken Ravizza say in Heads Up Baseball 2.0, “Your breath is something to go to to determine if you’re in control of yourself, and it simultaneously helps you get control of yourself.” Awareness is a crucial part of the mental game, and you can’t be aware of how you’re feeling if you’re not aware of how you’re breathing. Lastly, breathing helps you transition from training to trusting. If you were to think about your most successful performances, I think most all of you would realize that you weren’t really thinking about anything at all. This would be known as trusting - letting the work you’ve done unfold on the field without any conscious thought. Confident and successful athletes keep things simple, minimize thinking, and play with their eyes. While there is a time and place for training and conscious thought, it is not on the competitive field. Use what you have, trust the work you’ve put in, and compete with everything you have to win the next pitch. Oh, and don’t forget to breathe. Coaches - In your practices, keep it simple for kids: get them to first learn how to take a deep, visible breath. If you can’t tell they’re breathing from the dugout, they’re not doing it correctly. Also, do not let kids rush the breath - let them take their time on the inhale and completely exhale the breath. The exhale should be forceful enough so that kids are able to feel the tension being released from their body. Kids can add to this by shaking their arms, legs, and releasing their shoulders at the conclusion of their breath. Another huge point is the breath must have a purpose behind it. If kids are breathing but putting no intent behind it, they won’t get anything out of it - just like going through the motions in anything. To help with this, get athletes to notice the air coming in, the air going out, and how each breath makes them feel. Utilizing a quality deep breath is a great way to slow the athlete’s heart rate. If they still feel tension and anxiety after a few breaths, get them to slow things down and create a purpose behind each breath by bringing awareness to it. Once you’ve taught athletes how to breathe, get them to incorporate it into their daily practice routines! Teach them to use the breath in the warm-up and how to exhale as they reach the end range of motion in their body (yoga had this figured out a while ago). When an athlete boots a ball, get them to take a deep breath and release the error they just made. If a hitter rolls over a ball they know they should have crushed, tell them to step out, look at a letter on their bat, and take a deep breath before stepping back into the box. Get your pitchers to take quality deep breaths between every pitch - in practices and in games. If you don’t do it in practice, don’t expect it to magically show up in games. Be creative in how you teach each kid to utilize the breath, but keep the main thing the main thing: When the game starts to speed up, get kids to breathe and slow it down! For more information about different ways to use the breath, when to use it, and how to improve it, Alan Jaeger's blog (see Mental Practice: A Daily Routine and Mental Training Talk and Practice) thoughts from Lantz Wheeler, and Heads Up Baseball 2.0 are a good place to start. Feel free to reach out with any questions or concerns! In today’s consumer culture, we are drowned in advertising for products and services that are guaranteed to give you the life you’ve always dreamed of almost instantly. Want more money? Just buy this program and you’ll be drowning in financial success! Want a better body? Take this pill once a day and you’re on the fast track to a six pack! Want more fastball velocity? Just go to this pitching guru and he’ll share mechanical secrets to get you lighting up radar guns in less than two weeks! While no sole person or company is the culprit of this movement, I believe a multitude of factors have created what people have coined “The Quick Fix Myth”. Quick fixes are essentially synonyms for shortcuts. It is the expectation that the least amount of work should yield the greatest results. People who seek quick fixes just don’t have the time, energy, or motivation to get things done like the rest of us. They want the gold at the end of the rainbow, but the trail to get there is just not worth their time. In terms of training, these athletes are the ones who are always looking for that one thing that’ll transform them into the player they crave to become. Examples of these could be a mechanical breakthrough, a specific drill, or a cunning training program that is guaranteed to add 5-10 mph to their exit speed. If it’ll make them a better player, they want it - just without any real effort or hard work. Oh, and they want it now. Swing feels a little off? Nothing a quick 30-minute lesson can’t fix. I mean, who has the time to actually hit three to four times per week? Having issues with your command? Just get to your balance point and you’ll be painting corners in no time! It can’t and be because you barely touch a baseball outside practice. Sure - making small mechanical tweaks can be a difference maker for athletes at times, but is it the entire picture? Is showing up for a half hour lesson once a month really going to do anything to help make significant long term changes? Is your back elbow really the culprit for lack of success at the plate, or is it because you’re not hitting at all outside of games? Is searching for that perfect supplement really going to help take your workouts to the next level? Or is actually working out? In life, there are no shortcuts to success. Quick fixes don’t exist. John Wooden didn’t win his first national championship at UCLA until his sixteenth year as head coach. Steve Jobs had to get fired from his own company before he was able to take Apple to unprecedented heights. Milton Hershey ran three different candy companies into the ground before eventually building one that stayed afloat (I don’t think I need to tell you what it’s called). What is the common denominator in all of these stories? It’s simple: These guys showed up every day, embraced the challenges before them, and worked. As you can see from above, putting in work isn’t always going to get you the immediate results you want. Thirty minutes of cage time isn’t going to transform you from the nine batter in your lineup to the three hole - but thirty minutes three times per week over the course of twelve months might. Progress requires consistent, deliberate hard work over a long period of time. Those who are willing to invest the necessary time, attack weaknesses, and constantly find ways to improve will eventually be rewarded for their efforts. Those who want the glory without the blood, sweat, and tears will always seek the shortcuts - and hard work always beats shortcuts. Quick fixes may help you feel good now, but they will never be a substitute for hard work. This is one of the sole reasons why Carmen created a year-round training program for baseball and softball athletes in central PA. Maintaining and refining your craft requires much more than just a ten lesson package. Through the year plan, we are able to offer kids an incredible deal where they can train and receive professional level information up to seven days per week over the course of an entire year! If you’re serious about your development as a player, get in contact with us and we can get you scheduled for your free assessment. We understand what it takes to become the player you want to be, and we’re willing to create every opportunity for you to make it happen. If you want to work hard, crush goals, and take your skills to levels you’ve never seen, we can help you. If you’re looking for a quick fix for the reasons why you can’t get it done, you’ve found the wrong place. Until then, keep working, learning, and growing. As a staff, we held and ran our second coaches clinic Saturday, January 12. Over the course of 100 minutes, Carmen and I offered ideas to a panel of coaches who were interested in taking their practices to the next level. It was a great event and we plan on resuming these on a monthly basis starting in May! For those of you who couldn’t attend, I wanted to share some of the main points we discussed throughout the clinic. Everything we talked about ultimately came down to two main ideas: catch play and the mindset. Throughout Carmen’s time in collegiate and professional baseball, he learned that he is able to determine the quality of a player by simply looking at how they play catch. Why? Well if you think about it, everything done from a defensive standpoint involves a throw and a catch! It doesn’t matter whether you’re a pitcher, catcher, shortstop, or center fielder - playing catch is the basic fundamental of defense. As coaches, it is our responsibility to put a premium on catch play so it can eventually be done at a high level on a consistent basis! Emphasize it! What you place your importance on is where you will see the majority of your improvement. How you execute catch play will determine the quality of practice that follows. Have kids present a clear target in the middle of their chest. Players need to be locked in on a specific target before every throw they make. Confident players play with their eyes, so it is important that we teach them how to do so! Make a firm throw through the player’s target. Catch in front of your eyes! Don’t let the glove drift behind their body when they catch. After all, you can’t catch what you can’t see! Catch with your feet! Don’t let the feet become stagnant during catch play. Good footwork is a prerequisite for catching and making strong, accurate throws! If it touches your glove, you own it! Keep track of drops, reward partners with the least amount of them. We recommend playing catch anywhere from 10-15 minutes to start practice. Some guys like playing catch for longer/shorter periods of time, but building a solid base of catch play is crucial to improving an athlete’s work capacity. Give a different target every three throws. Utilize long toss! It’s a great tool to help build optimal mechanics for arm health, velocity, and command. If you’re inside, you can practice this by throwing it into a net at different angles and intensities. Alan Jaeger of Jaeger Sports has some excellent content on this kind of stuff (see his blog at JaegerSports U). Use games! One of our favorites is 21, where players earn 3 points for a hit target and 1 point for a hit target lane. The first to 21 (win by 2) wins the game. Come up with different challenges and see what the kids enjoy. Be creative! The second theme we discussed was creating a winning mindset. As Carmen likes to say, baseball is played from the neck up. Failure and adversity are an inevitable part about being an athlete, let alone in a sport where failing 7 out of 10 times makes you a Hall of Famer! I don’t think we need to argue how important the mental game is, but the point becomes: How often do we really practice it? If 90 percent of this game is mental, why do 100 percent of our practices focus on the physical part? Spend 5-10 minutes before practice to teach the mental game. Ken Ravizza and Harvey Dorfman are two great resources to get you started here. Breathe! Breathing gets oxygen to the brain which helps athletes think more clearly, slow their heart rate, demonstrate positive body language, release the last pitch, and get focused on the next pitch. When the game speeds up, get kids to breathe! Develop routines! Teach them how to do things like stepping into the box, tapping the plate, creating rhythm, picking up the pitcher, and stepping into a good pre-pitch position. We’ll post more content about this eventually, but creating good habits is crucial to developing a strong mental game. Develop a release! This might be the most important skill a player can learn when it comes to dealing with failure. Some examples include grabbing a handful of dirt, wiping away the rubber, looking at a letter on your bat, picking out a focal point at the field, walking behind the mound, unstrapping batting gloves, or taking off your hat/glove. These are most effective when utilized with a deep breath. Compete! Mechanics don’t win baseball games. Teach kids how to compete with 100% of what they have to win the next pitch! It doesn’t matter if you have your A, B, or C game - how you feel is no excuse for your inability to compete! Get creative with this! Create team/individual challenges that have a winner and a loser. Losers must have a consequence - just like a game. Competitions are a great way to heighten focus, improve performance, and build teamwork. Utilize them to your advantage! At the end of the day, you can’t expect your kids to perform skills they don’t practice. If you don’t police catch play, why should you be upset when your pitcher can’t throw strikes? Why should you be upset when your shortstop boots one and throws one into the bleachers when you haven’t taught him how to regroup on a bobbled ball? Why should you expect your kids to move on from their last strike out when you haven’t given them any skills to do so? For more information on future clinics, follow us on Facebook, Twitter (@CFProBaseball), and Instagram (@carmenfuscoacademy). Keep on getting after it! I recently attended the 2019 ABCA Convention in Dallas, TX from January 3-6 (It is a wonderful event and I highly recommend it to anyone who is interested in coaching!). At the convention I was able to listen to Steve Springer speak about hitting. Springer enjoyed a 14-year career in professional baseball amassing 1,592 hits in 1,591 games with six different organizations. He previously worked as a performance coach for the Toronto Blue Jays where he instructed players about the mental game. Some of Springer’s clientele include MLB All-Stars Paul Goldschmidt, A.J. Pollack, Mark Trumbo, and Nolan Arenado. Throughout the talk, Springer emphasized the importance for a hitter to have an approach. In his opinion, it is the most important part about hitting! He teaches the approach through a few simple ideas that kids can start implementing immediately in their game. Like any physical skill, they need to be worked on and practiced so they can transfer to games. The first point Springer made was 90% of a hitter’s success is about walking up to the plate with confidence. This is so hard for a lot of kids because they constantly beat themselves up over things they do not have any control over! The biggest culprit of these is their most recent game performance. It’s easy to feel confident when you’re 4-4, but it’s very hard to feel good when you haven’t had a hit in your last 10 at-bats! This becomes the ultimate challenge: How do you consistently walk to the plate with confidence regardless of the score, your stats, or the guy on the mound? Springer believes it begins with adopting what he calls an “Opening Day” mindset. No hitter on Opening Day has ever walked to the plate without any confidence. Why? Because they don’t have yesterday to beat them up! It’s easier said than done, but walking to the plate feeling the same way when you’re 4-4 or 0-4 is critical for consistent performance. When you don’t have the weight of your stats beating you down, you’re free to play the game focused on the most important pitch out there - the one you’re about to see! Second, Springer believes kids need to change their goal when they walk to the plate. Instead of trying to get a hit, Springer believes kids need to go to the plate with “an attainable goal to hit the ball hard and help their team win.” Of course it’s important for hitters to get their knocks, but sometimes getting to first base depends on a little bit of luck. Jonny can dribble a ball down the third base line, turn it into an infield single, and then smoke one at center fielder his next at-bat - only to be caught! This is why Springer dislikes using batting average to measure the success of players. Instead, he likes to use quality at-bats. Some examples of quality at-bats include hitting the ball hard, drawing a walk, seeing a lot of pitches in an at-bat, laying down a sacrifice bunt, or scoring a run through a ground ball or fly ball. All of these have one big theme in common - helping your team win the game! For these reasons, Springer believes hitters need to forget about getting base hits and instead focus on what they can control - hitting the ball hard and helping their team win! By committing to a consistent, attainable goal with your focus on the good of the team, your stats will take care of themselves. In the batter’s box, Springer talks about “hunting speeds”. These speeds (pitches) should be determined by what the pitcher is throwing and when. As Springer likes to say, “Should you look for what you want to get? Or what you’re going to get?” This involves the hitter dialing in on a specific pitch and a location on the plate (in, middle, out) for every count that they’re in. By creating a narrow focus, the hitter is going to be more prepared for what’s to come by anticipating a likely outcome. 90% of a hitter’s success is walking to the plate with confidence. Believe in your abilities, you are a good hitter! Adopt an “Opening Day mindset” - no pitch is more important than the pitch you are about to see! There’s no sense in letting yesterday beat you up when yesterday doesn’t win the today’s games! Go to the plate with an attainable goal to hit the ball hard and help your team win the game. You create pressure on yourself when you make it about yourself and your statistics. Focus on being a great teammate! Look for what you’re going to get, not what you want to get! Hunt one speed in a specific part of the plate. It’s hard to hit 95 and 79 at the same time! For more information about Steve Springer, you can visit his website at qualityatbats.com or follow him on Twitter @qualityatbats. Reach out to us with any questions or concerns. Keep on getting after it!